The end of the Cold War has given way to the idea of consolidating democracy as ‘the only game in town’. A question which is seldom asked is- When did the Cold War end? A better way to phrase that crucial question would be – When did the Cold War begin to end? By the beginning of the 1970s it was plain to see that the post-war international order informed by a bipolar alignment of world politics could not be sustained in the long run. On the one hand, the Soviet Union was experiencing declining rates of economic growth. On the other hand, the United States was going through the traumatic experience of the aftermath of the Vietnam War and the onset of stagflation (low economic growth and rampant inflation). In addition, the international situation had changed drastically. Western Europe and Japan, aided by the gold standard and free trade, were becoming economic powerhouses and acquiring a growing political independence vis-à-vis the United States. One man, and a group of intellectuals, saw the future. Ronald Reagan did not come to power with the intention of prolonging the confrontation with the Soviet Union, but to end it once and for all. This process was facilitated by policies devised by policy-makers and diplomats of neoconservative persuasion like Richard Perle, Jeanne Kirkpatrick, Francis Fukuyama among others. Neoconservatism stands for curtailing the size of government when it comes to social entitlements and expanding it for the purpose of fighting ‘evil’ and propagating democracy. 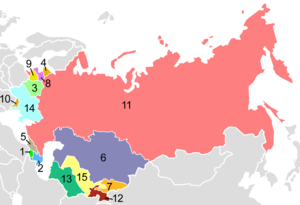 The Soviets and their acolytes were confronted in a variety of locales (including Afghanistan and Central America). Soviet Communism was outspent out of existence thanks to the massive increase in the military budget and the modernization of the American armed forces. With the end of the Cold War and the dissolution of the Soviet bloc, the neoconservative focus of attention turned to the Middle East. 9/11 prompted renewed efforts to extend democracy to countries governed by regimes hostile to the United States, such as Saddam Hussein’s Iraq, the Taliban-run Afghanistan and Ghaddafi’s Lybia. Neoconservatism was at its zenith during the Bush administration. The idea which propelled regime change in Central Asia and the Middle East is the concept of democracy as a universal political category, which can be applied to all countries regardless of their cultural make-up. In many ways, the fight against terrorism and the idea of propagating democracy had been concocted long before 9/11. During the Clinton era neoconservative intellectuals had put forward their ideas for a ‘conservative internationalism’ crusade; expounded in the various documents produced by the Project for the New American Century. Here is the crux. According to neoconservative thinking, entrenching globalization (understood as the marriage between free market economies and liberal democracy) warrants the use of force when alternative political and economic regimes threaten the security of the United States. Francis Fukuyama is an American political scientist, political economist, and author. With the onset of the War on Terror, the Fukuyaman template of ‘democracy as the final port of call for mankind’ suffered a tremendous blow. It created, as Robert Kaplan would put it, a ‘return to history’. Globalization is here to stay. However, what is being fought for is what kind of globalization will prevail. There are alternatives put in place in countries like Russia and China. These are, nonetheless, inimical to the spirit of globalization as understood by the West. Blueprints like ‘illiberal democracy’ (Russia, Venezuela) and ‘authoritarian capitalism’ (China, Gulf Countries) could potentially damage the long term prospects for democracy, the rule of law and free markets. The Concept of War in Neoconservative Thinking, published by IPOC, examines the theoretical context which underpins neoconservative foreign policy. The author, Matteo Albanese, chronicles the ascendancy of the neoconservative movement to the highest echelons of the American establishment, making reference to a number of crucial philosophical antecedents that shaped its ideological evolution. Albanese argues that the ideological and strategic aspects of neoconservative thinking are informed by the ‘friend-enemy’ dialectic expounded by Carl Schmitt, resulting in a worldview which revolves around the concept of perennial conflict. The neoconservative way of war is also informed by the teachings of Leo Strauss, who advocated the dissemination of ‘noble lies’ in order to keep a cohesive social order. The battle for democracy, free markets, the rule of law and the preponderance of the West in a globalized work has been joined. Albanese’s work enables us to understand the framework in which this battle is fought. Dr Nicolas Lewkowicz, PhD, FRHistS writes for Democracy Chronicles from Albuquerque, New Mexico. He is a Research Professor at University of New Mexico and a Fellow at Royal Historical Society.